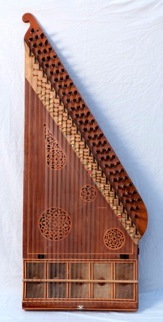 The Arabic word ‘qanun’ derives from the Ancient Greek ‘canon’, meaning law or rule. Unlike for example the violin, where the exact intonation depends on the skill and ear of the player, its strings are tuned in advance and define the scale to be used, hence the name ‘qanun’. In a musical world where a tone can be divided into nine micro-intervals, it is a great comfort to the qanun player to know that he or she is always right. The instrument is mentioned as early as al-Farabi (c.950 CE) but the contemporary form dates back to a revival in the eighteenth century. It is played with two plectra attached by rings to the forefingers of each hand.